Hear the gentle roll of the waves...feel the refreshing ocean breeze...bask in the pure sunlight of unadulterated paradise. Tropical Impulse, a beautiful oceanfront getaway overlooking a private beach of pink sand, offers 3 bedrooms, all with their own private bathrooms. 2 of the 3 bedrooms are upstairs, offering magnificent views of the ocean. The third bedroom is downstairs allowing for individual privacy, but retaining the beautiful view. Savor a luscious sunset from the expansive deck, or enjoy snorkeling through reefs teeming with underwater wonders in the coral reefs off the beach from the house, or soak up some sun on the pristine beaches - all just a short walk from the door. High speed internet/wi-fi; satellite t.v. Separate dining room, breakfast counter with stools, lanai (expansive balcony with a shuffleboard court), ceiling fans, telephones both upstairs and downstairs, linens (bath & beach towels included), 2 TVs both with a VCR, and a DVD player upstairs, washing machine and dryer, barbecue. Suitable for children (playpen/crib, sand toys, baby pop-up tent). One clear bottom ocean solo/duo kayak for reef viewing, one solo/duo ocean kayak. 1 queen, 2 doubles, 2 twins, 1 sleeper sofa. 2 kayaks; central air-conditioning; DVD/CD player with surround sound system; wi-fi; hammock. We spend one week in paradise. The house is beautiful And completely equipped, the 30 seconds walk private beach is amazing And Kenneth is one of the most gentle host We ever had. Eleuthera Island is magnificent, beautiful, relaxing… So many wonderful things. At the end of the day exploring, hiking, snorkeling, or just sightseeing, we were so happy to come home to Tropical Impulse. As beautiful as Eleuthera it is, I would not describe it as luxurious. The house, however, was always a lovely oasis to return to at the end of the day. Highly recommend; hope to return ourselves someday soon. Great for families, couples, or small groups of eight people or so. 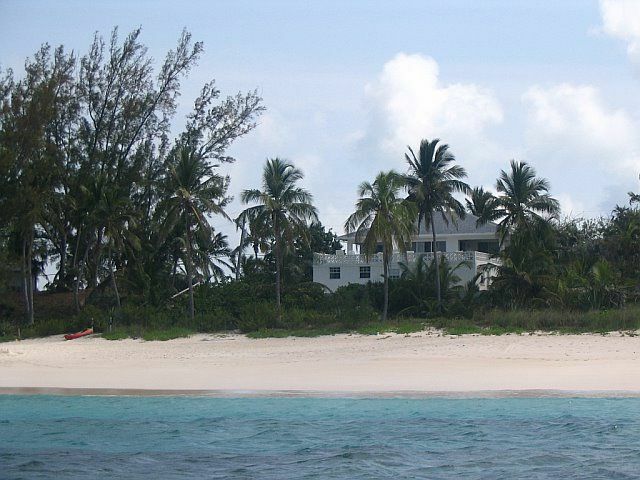 Spacious, well-equipped house on beautiful secluded beach perfect for r&r. Enjoyed cocktails and grilling on large deck overlooking the ocean. Good snorkling off beach with many fine coral reefs. Easy access to everything around Governor’s Harbour/Palmetto Point. Would definitely stay here again. Our family stayed for a week at Tropical Impulse. The home and beach were wonderful. The location was perfect - it gave us the opportunity to travel north and south and enjoy the beaches Eleuthera has to offer. The owner was an excellent source of information on the secrets of the island. I would highly recommend this home for a vacation paradise. Our fourth trip to Eleuthera but our first time here at this home. Great location. The hammock and the deck were my favorite part of this house. Hope to go back. Wish it was tomorrow. Ken was great & his caretaker perfect. Our stay at Tropical Impulse was everything we had hoped it would be. Lots of fun in the sun, beautiful, secluded beach and amazing aquamarine water. The house was lovely, clean and comfortable. The views from the deck where breath taking and the kids even enjoyed a game or two of shuffleboard. The owner, Ken was very easy to contact and communicate with. You will need transportation to reach this slice of paradise and to see the rest of the island, but renting a car was not difficult. We had a wonderful time during our stay here. Just a short walk down the path lies a completely private beach. It sports beautiful pink sands perfect for beach-combing to find the perfect shell. Our beach is one of the best on the island for snorkeling and scuba diving. Directly off of our beach lies a huge expanse of reefs there for your enjoyment and exploration. Enjoy using both of our ocean kayaks. They are both solo/duo kayaks, and one is even clear bottomed so that the reefs can be enjoyed without even getting wet. The soft sand and mellow waves make for a perfect swimming environment that can be enjoyed by adults as well as children. There are an abundance of great activities for the whole family in close proximity to the house. They include exploring deserted beaches, chartering a boat for either deep sea or bone fishing, perusing shops throughout the island, and much more. There are several restaurants nearby the house that serve great food including many local delicacies. $1795-$2095/week $2,095/week January 1 - August 31. $1795/week September 1 - December (excluding Christmas & New Years). $2895/week Christmas/New Years. Per rates are for six people - add an extra $150 per person over six.